We all have a natural tendency to try to choose the shortest and the easiest route as we travel to a location. The fundamental desire is to not exhaust oneself unnecessarily, preserving energy, which of course is wise. However, finding the middle way between those two sometimes opposing aspects can be difficult and there are many things to take under consideration. Let’s have a look at some of those. Especially for those inexperienced in travelling off-trail, leaving the perceived safe trail can feel discomforting or even frightening as one leaves the last outpost of ordered society, being forced to trust completely in one’s own capabilities. It always feels safer sticking to a clear and marked trail, and for most people it of course also is. However, leaving the trail can be quite safe as long as you are properly equipped and have the knowledge and skill to use your gear. A detailed map of the area and a compass are crucial if you are not very familliar with the area beforehand. It is very easy to lose your directions when walking through dense woods as you turn back and forth avoiding obstacles blocking your path. People also have a natural tendency to deviate from a chosen path and walk in circles, especially in cloudy weather. On a fundamental level there are only two basic ways of navigating; observing and memorizing your surroundings or using external tools like a map & compass, gps etc. Using the latter method, you should of course also utilize the former. And as your tools may fail or get lost, you should also have a rudimentary knowledge of how to navigate without them. The former method is far older, far more used and more “natural”. It relies on using landmarks, the sky and on knowing a few signs of direction in nature, like on what side of a tree moss & lichen grows the thickest on, the leaning of ant hills etc. Choosing high ground commonly gives you a better overview for navigation. Also, choosing not just one, but two reference points, one in front and one behind will help you keep you on track. Focus not just on where you are going, but also where you have been. Try to remember landmarks like hilltops and valleys, unusual trees, rocks or shapes in nature so you can return the same path if needed. Smaller landmarks are preferable to larger, so aim for a tree on a mountain rather than the mountain itself. Still, they have to be visible from a distance of course, or they are useless. Remember to look back at the landmarks as you have passed them, so you see them from different angles. A good pair of binoculars can be of great use to find your landmarks again if you happen to deviate on your return. As we are not so used to seeing the difference between one rock or tree and another and as we rely less and less on our own memory to aid us, it can be good to make notes of landmarks and even take pictures. That also helps you with the next topic. Learning to know the land is always good and you can do so making excursions from trails or locations you already know, creating wider and wider circles from your location. Make sure to use good landmarks that you keep in view so you can return to well-known areas easily. And as always a good map helps you gain a better overview, as does using high ground for better lookout. Once you know the land you will also know how to move around the easiest. Don’t get cocky though, thinking you can trust completely in knowing your area too soon. It is quickly done getting lost. And things can still surprise you. In areas where there are a lot of hills and valleys, of whatever size, it makes sense to choose a more winding path to avoid having to climb hills. However that also depends on the ground, whether it is firm, soft or swampy. 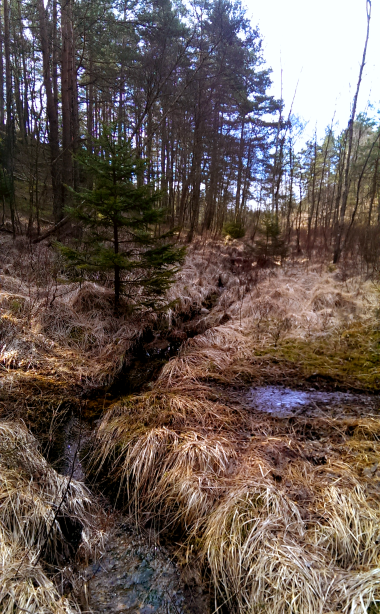 Oftentimes in Scandinavian forests you will find that the ground near lakes and streams is swampy, especially in winter and fall or with spring flooding, and very uneven with bumps of grass with knee deep mud inbetween. Up on the ridges however, ground is usually a lot firmer, covered only in moss, heather and blue- and lingonberry shrub, making it far easier to walk. Also keep in mind that moving off-trail is commonly considerably slower than moving on a prepared trail and a lot slower than moving on even & firm ground. It is also far more energy consuming requiring more rest, so don’t be overoptimistic about time. If you are forced to walk through mud, try to step where grass clumps together, on fallen trees or near trees, since their fine roots will make the ground more firm. You can also use trees and brush for support but keep in mind that it might not hold. A seemingly strong tree may well be rotten through, causing you to fall if you lean on it. Keep in mind that you are much more clumsy with a backpack on, so regaining your balance when you slip will be difficult. A small detour might be wise to avoid the worst parts. 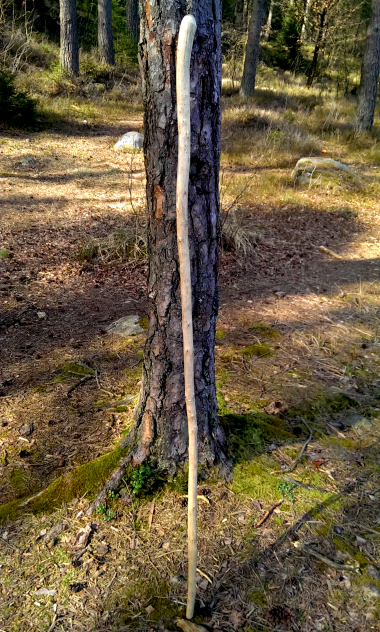 A walking stick is an amazing tool which makes any hike far easier. With it you can keep your balance better, walk through difficult passes in odd stances, since you are basically a tripod, and you will also find it easier to avoid slipping and jumping over streams. It also eases off some of the stress on knees and feet when you carry heavy loads on uneven ground. There is a reason why pilgrims and wanderers have been using sticks for millennia. You can make a stick easily yourself, but make sure to follow the regulations in the area. A good stick reaches your chin and is strong enough to not break when you put a good amount of weight onto it. Obvious physical dangers is something most people look for, at least when they walk alone. Walking together with others however, people tend to be less observant about their surroundings. Likewise, when tired or exhausted, people switch to close-focus mode, not seeing much farther than the next few steps. This can become dangerous, both since it is easier getting lost, but also since it means you are not really looking out for possible dangers and risks. Is there any risk of falling, e.g. if the side of the path drops close to where you walk? Is the ground slippery, icy or muddy? Is there risk of stumbling or slipping on tree roots, leaves or gravel? Always assume that the stones or rocks you plan to step on are loose. Is the ice you plan to cross really thick enough to carry your weight? Walk safely, testing the ground before putting your full weight on your foot. Keep in mind that the ground around lakes can consist of floating moss and grass that look solid, but actually floats on several metres deep of murky water and with bad luck you can actually fall through it. I myself have fallen waist-deep into such a hole when I was young and less wise. Use a stick to help you walk safely. And don’t stick your hands into your backpack carrying harness causing them to get stuck if you fall. 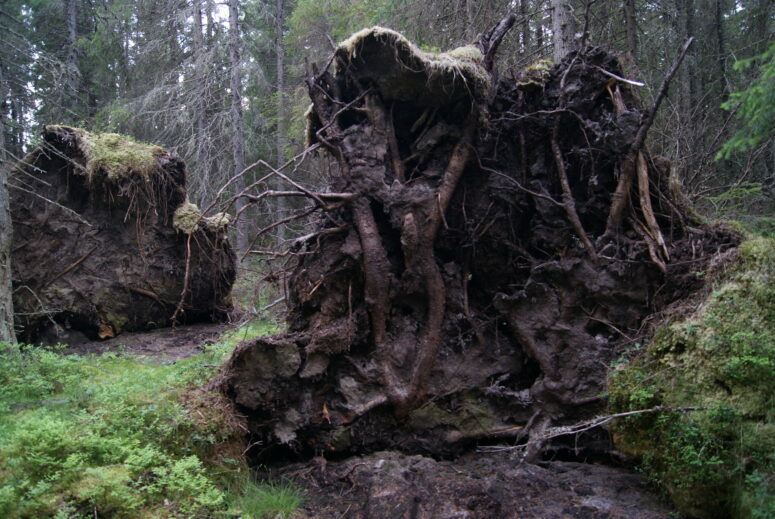 Although looking static, dead trees can both fall further down or even rise up again after they have fallen. For that reason be careful in taking cover under the roots of a fallen tree so you don’t get trapped underneath the roots and don’t use it for night shelter. It is far better to create a proper shelter. For the same reason, don’t crawl underneath big fallen trees. Instead climb over them, or walk around them. Be watchful for branches and twigs that stick out, especially when you feel tired or in bad light conditions. Getting a pointy twig in your eye can be very painful and even cause permanent injury. Better to move slow and safe than the opposite. Also dead branches can fall down as you pass underneath a tree. Don’t just look down into the ground, but also look up, thus getting a better overall view over your surroundings. Also be observant about tree types as e.g. fir is less of a risk for falling branches than pine. Two plants to watch out for in particular is Björnloka (Hogweed) and Jättebjörnloka (Giant Hogweed). The sap from the stems and leaves can cause large and severe burns and blisters that stays for weeks, sometimes causing illness for months, with risk of permanent scars and discolouration. Just a brushing against the skin can be enough and if you get it in the eyes it can cause blindness. Sunlight makes the poison worse causing a phototoxic reaction. If exposed wash with soap and water immediately and avoid sunlight for at least two days, even if there are no symptoms. 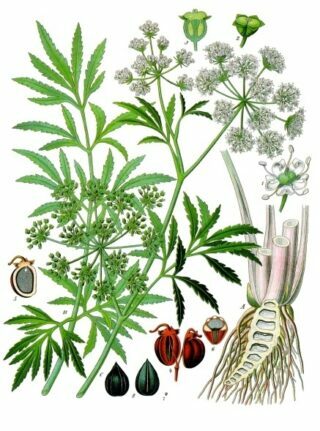 Another similar plant that is highly poisonous is Sprängört (Cowbane or Northern Water Hemlock). The whole plant is very toxic and the poison causes epilepsy-like seizures that can lead to death. The plant is usually found near or in shallow muddy waters near lakes, ponds, canals, ditches and marshy areas. One of the problems with these plants is the superficial similarity to Hundkäx (Anthriscus sylvestris) or Cow Parsley as it is called in English. Children might think they are the same, and while the latter is harmless, Björnloka is the exact opposite. Learn the difference and teach it to your children too. Brännässla (Stinging Nettle) is another plant to avoid. While not dangerous, it is certainly unpleasant to touch with bare skin. It is great for spring soup though. Although you are not very likely to meet any dangerous wildlife in Scandinavia there is still the rare chance it might happen. 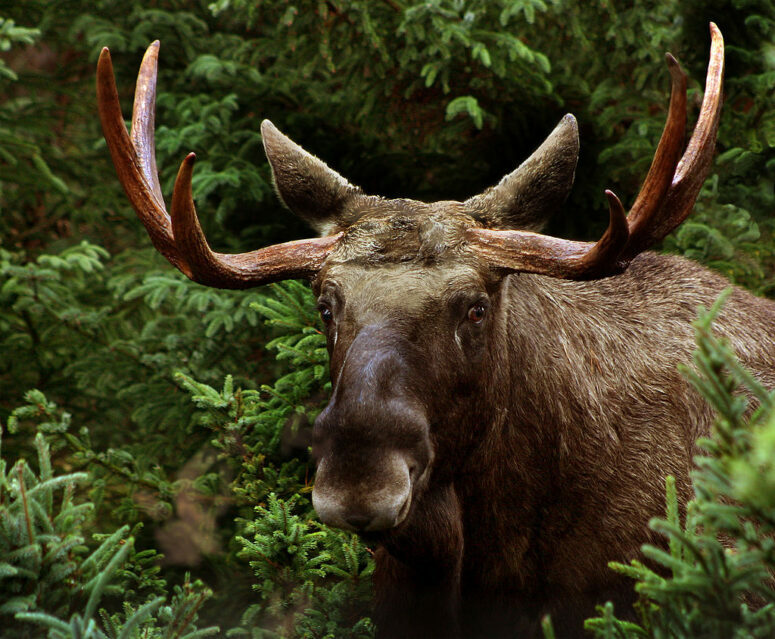 The most common wildlife are moose, doe, deer, hare and snakes. Wild boar are getting more and more common, especially in the south-eastern half of Sweden and can be quite aggressive. Less common are fox, badger, beaver, lynx, wolf and bear, while raccoon dog and wolverine are found only in northern Scandinavia and are rarely seen even there. Wild reindeer still exist in Norway and Finland, but is extinct in Sweden. Especially in springtime wildlife can be dangerous as they tend to be protective of their cubs and calves. Watch out for fresh droppings or tracks in the ground. Wildlife will normally try to stay away from you and have already heard you coming a mile away, but cubs and calves can get caught or move slowly, thus forcing their parents to stay and protect them. Making noise keeps you safer as it forewarns the wildlife of you coming. If you encounter a moose or a bear, just back away calmly. The only venomous snake you will find in Scandinavia is the the Common European Viper (Vipera Berus). It is easily identified by the zig-zag pattern on its back. It is generally not dangerous to humans, but the bite stings quite badly and if you are allergic to insect bites then it can actually be quite dangerous. If bitten you should seek medical treatment straight away. You are more likely to encounter the Water Snake (Natrix Natrix) which is non-venomous and is easily identifiable by its black colour and white spots near the head. 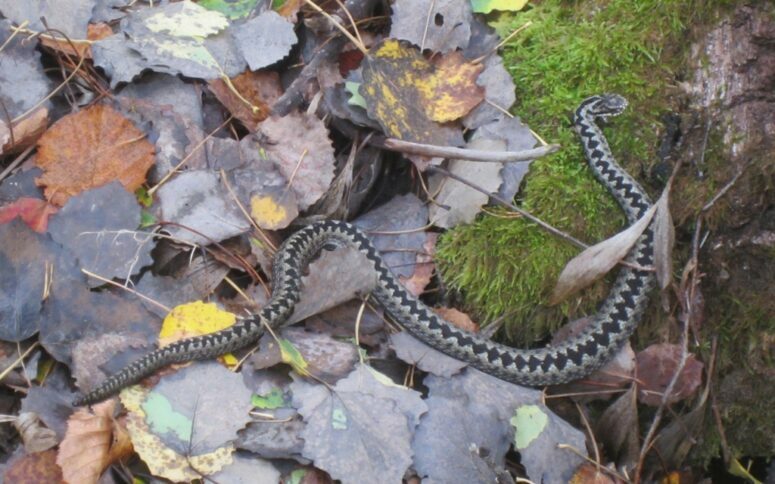 Smooth Snake (Coronella austriaca) is another non-venomous snake found in Scandinavia. It is brown in colour and people sometimes confuse its pattern with that of the Viper, but while the latter has a zig-zag pattern, the Smooth Snake has dark spots in two lines along its body, separated by brown. All snakes are protected species in Scandinavia. There are no really dangerous insects in Scandinavia. However, again, if you are hypersensitive to bites or stings from e.g. wasps then it is still something to consider. The vespula build their nests in holes in the ground and the European Hornet (Vespa crabro) prefers holes in old trees, so watching where you step and listening for their buzzing is wise. I have personally stepped on a nest when taking a leak in the woods and it is not a particularly pleasant experience, although certainly an entertaining sight for any spectator. Keeping a comfortable temperature is important for any season, but especially so in cold weather. Sweat-soaked clothes can cool you off considerably and quickly once you stop walking, so regulating your clothing to avoid sweating or freezing is important. Likewise choosing to walk in the sun or shade can help you regulate a good temperature and help avoid hard sunburn or snowblindness. Hills and valleys, forest or open terrain also offers very different wind conditions. Generally walking among trees means less wind. However in hard wind it also means an increased risk of being injured by falling branches and trees. Large bodies of water often mean cooler temperatures and more wind. As already mentioned, when walking in group or when exhausted people tend to narrow their field of vision to their immediate surroundings. This will easily cause troubles with all of the above and may risk you getting temporarily or even permanently lost, or to stumble across unwanted surprises with difficult terrain or even hostile wildlife protecting their offspring. Even disregarding those important considerations unconsciously filtering your surroundings will inevitably cause you to miss out on a larger and greater experience that may be just a handful of steps away. so, learn to be aware of your larger surroundings as you move about. Look in all directions, occassionally stopping to take your bearings or just to enjoy nature. Constantly look forwards, up and to the sides. And take your time. It goes without saying, but choosing good, reliable gear for your trip is of course quite important. Choose boots or shoes that you know you can trust, that will keep you dry and offer good traction on the surfaces you will move over. Never wear completely new boots or shoes or you are quite likely to suffer painful blisters. Trying new footwear out shorter distances on flat ground is not enough to judge them by. Likewise, make sure your compass works properly and that your map is valid. Keep them safe at all times, never in an open pocket that it might fall out of, and always on your person. Bring water and food since being hungry or thirsty means you actually lose a good amount of intellectual capacity, causing you to think less clearly and possibly making less wise decisions. A small first aid kit is also wise to keep on your person. All this might seem overly complicated, but bit-by-bit it comes natural when you walk about. Mostly, it is just a matter of awareness, and you will quickly come to appreciate how much greater an experience hiking around is when you begin to actually see your surroundings and figure out how to move about with your heavy backpack with less effort.